CARACAS, Venezuela – Venezuela descended into political crisis Wednesday. The leader of the political opposition declared himself interim president over embattled President Nicolas Maduro. 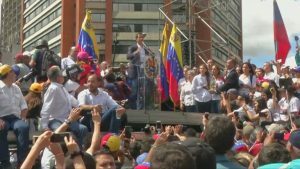 Juan Guaido symbolically took the oath of office in front of a crowd of cheering supporters in the capital, Caracas. His defiant speech followed anti-government rallies in cities across Venezuela. Minutes later, President Trump declared the U.S. would recognize Guaido as the country’s legitimate leader. Brazil, Colombia and Paraguay all quickly expressed their support for Guaido as did Canada. Maduro answered President Trump, giving U.S. diplomats 72 hours to leave Venezuela. He greeted supporters who gathered outside the national palace after Guaido’s declaration.